Home News CREDIT WHERE CREDIT IS DUE… IN FLORIDA!!!! Gecko’s Grill & Pub, a fabulous chain in Florida, has been doing such an incredible job. The overwhelming volume of crayons they’ve donated have made their way around the United States and overseas to the smallest of villages in Morocco. So many children have benefited from their generous efforts. However, it has come to our attention that the amazing young woman who started it all was never given proper gratitude. 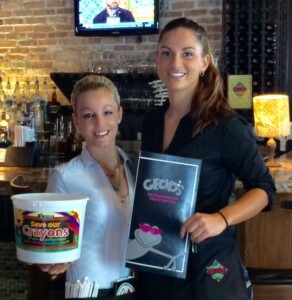 Savannah White, a server at the Gecko’s Grill & Pub on Hillview in Sarasota, Fl, is the woman behind our partnership. Savannah brought NCLB to the attention of her management, and it was her enthusiasm and persistence that made this relationship a reality. Thank you, Savannah!! On behalf of the countless children who have received crayons from you and your co-workers at all the Gecko’s, we are so so appreciative!! "Be excellent to one another."